Want to make a change to a room without breaking the bank? 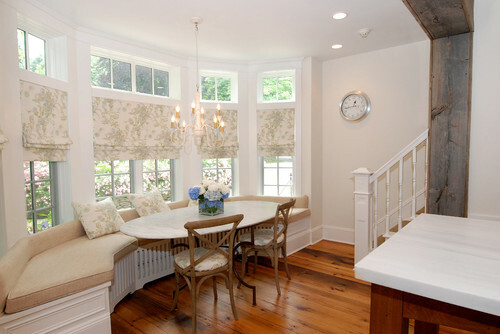 Changing out the window treatments is one of the best ways to do that. The window treatments in a room are like a nice hairdo. It may work for awhile, but eventually you will want a new look to freshen things up. However, most of us wish to do so without breaking the bank. So, I suggest that we just either update what we have, or find an inexpensive way to create something new. These ideas and updates for easy window treatments should provide a good place to get you started. If you already have a nice set of blinds, but find them to be a bit bland, consider adding some embellishments. I love the look of a decorative band placed about 1″ from the edge. You can add a band by attaching a nice quality strip of ribbon around the perimeter. I suggest actually sewing it in place to get a professional finish. But, if you do not having sewing skills, an iron on material can work for adding a vertical strip down each side. Just make sure that the adhesive is designed to hold the weight of the fabric being used. 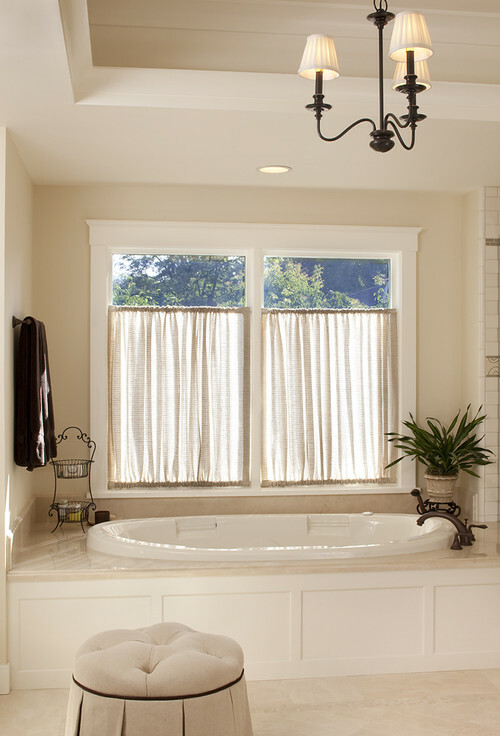 If you have transoms above your windows, consider lowering your blind to allow them to show. You can also do the opposite if you have already had your blinds installed in this fashion. It is a small thing, but it really alters the feeling of the window shape. 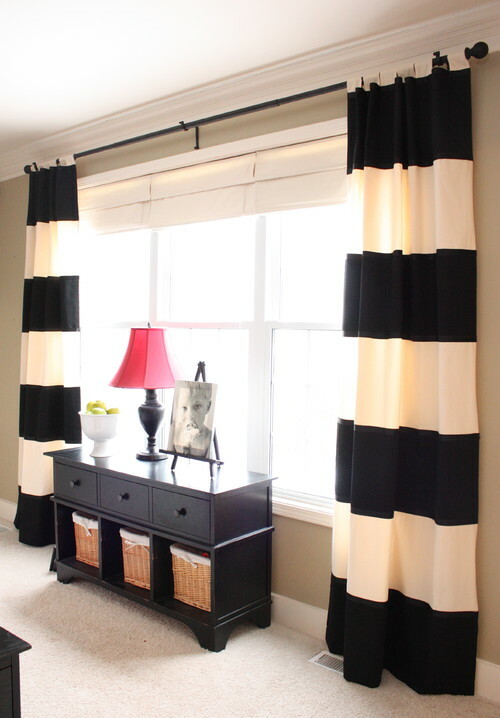 Speaking of easy window treatments, another very easy and cost friendly update for a plain blind is to paint stripes onto it. I suggest using painters tape and a high quality fabric paint, or even chalk paint, to do this type of DIY. This can work well for heavy weight fabric; however, it may not produce quality results for a lighter weight material. 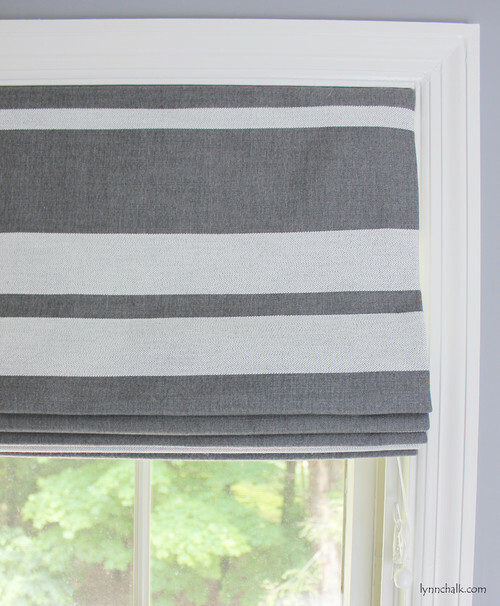 An easy DIY for someone who wants blinds, but doesn’t have any, is to do the tie up method. You can use pretty much any fabric that you like. All you need to do is to sew a rod pocket across the top. Then, gather the bottom up and tie it with your choice of fabric or ribbon. If you don’t want to sew, or don’t know how, you can forego the rod pocket and just use curtain rings that clip on. Another quick and easy solution is to mount a piece of fabric in place using tension rods. This will require just a bit of sewing to make the rod pockets. But once that is done, you just insert the tension rods and push it into place. Because you can make something like this from scrap material, it produces a cheap and quick treatment that you can afford to change as often as you like. 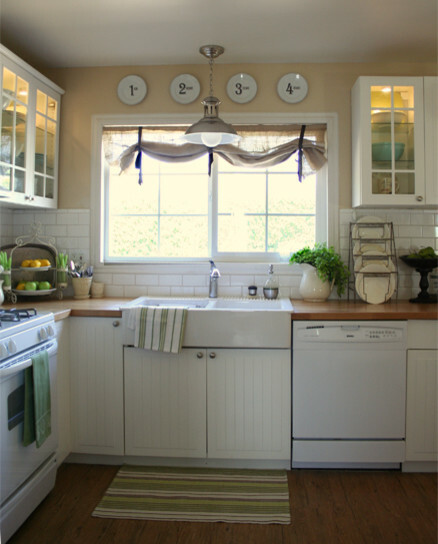 One of the best ways to bring new life to a window is to add something up top. That can be either a simple swag, a detailed valence, or my favorite, an upholstered cornice board. 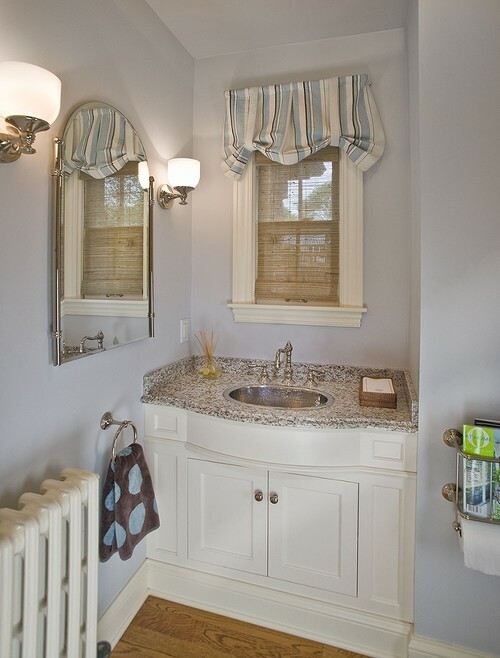 One very cute solution for a small bathroom window is to make a valence from a matching towel. To get the look above, a basic sewing stitch is used to create a pleat at the center side of the towel. Then, a rod pocket is sewn along that edge. The towel is held in place with pieces from a robe’s belt, but any fabric can be used. To get the perfect folds along the bottom edge, just use an iron on low to press seam lines in place before hanging. Then, refold the towel along those lines and adjust the straps to hold it to your liking. 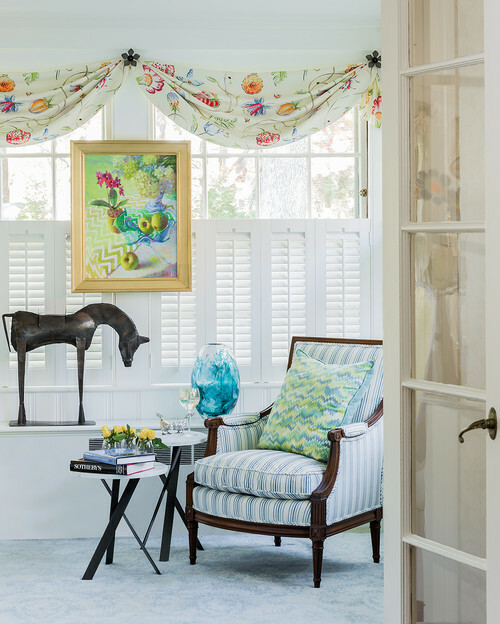 Swags are probably one of the simplest solutions to adding flair to a window. I have even just draped raw fabric, straight off the bolt, over hooks before and had a nice result. Again, this is one of those treatments where you can use any fabric that you like. It doesn’t have to be an actual purchased swag. You can put up absolutely anything that suits your fancy. An old table cloth? Go right ahead. An old sheet? No problem. Just as long as it will reach, and of course “swag,” the sky is the limit. If you are a handy do-it-yourselfer, you should probably consider a cornice board. They can be as elaborate or as simple as you want. They can be just painted wood or upholstered fabrics. However you like. To create a basic cornice, you simple create a three sided frame (I prefer to use 1×4 boards) that will slip over the window trim. This three sided frame is then faced with a solid piece of wood. (I prefer 1/2″ plywood). Then, you upholster the cornice and mount it above and around the window trim. FYI: an easy way to mount these is to use corner brackets like these (affiliate link). You can also use a cornice board to create unique toppers. This is one of my favorite types of upholstered cornice boards. It really doesn’t even look like a cornice board. I make these by building a three sided frame from 1x2s. The, add the plywood face just slightly shorter than the sides of the frame. (If the window is narrow enough you do not have to add a plywood face). The plywood is just to create support, but you don’t want it to extend all the way down or else it will peek out the bottom. Once the frame is built, the fabric is stapled in place, 1st) over and under the top edge of the frame. Then, 2nd) gathered to create pleats and stapled along the back of the sides. The results look very professionally done, but without the professional price. 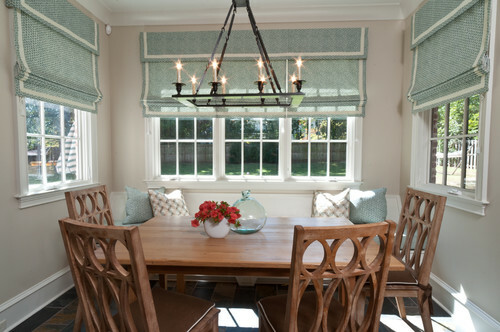 Adding drapes is a great way to update a look. One tip for hanging drapes is to mount them as high up as you can, usually at the crown molding. This will create height in the room and make the ceiling appear higher, as explained in a previous post on how to create the illusion of high ceilings. Also, don’t be afraid to mount those blinds above the windows as well. 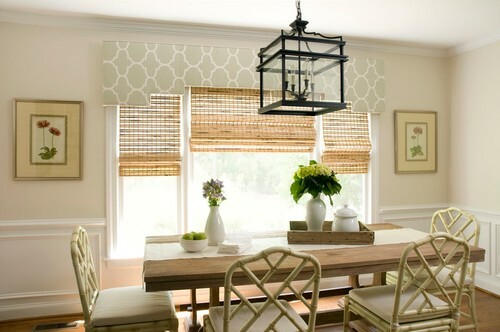 I like this particular image (above) because it shows the solution to creating window treatments around doors. You will notice that the windows do not actually extend all the way to the floor as the doors do; however, the illusion that they do is created with this technique. If you have drapes that are too short, and most store bought ones will be, you can always alter them by adding a band at the top or the bottom of the drape. 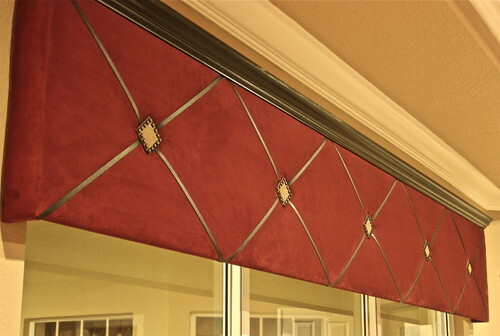 This will not only extend the length of the drape, but it will also create a designer look. Notice how much more professional these drapes look than they would had they been left solid white and short. One of my favorite things to do is to combine two sets of drapes into one set of unique window treatments. The above can be created by using a set of sheers and a set of heavier weight drapes. Cut each set into equally divided section and sew them together. It creates a nice display with the sun and looks quite lovely when hung. If you don’t want to change out your drapes but you want to add some pizazz to them, consider attaching an embellishment on the inner edge. A contrasting color will pop, while a matching color will add subtle details. Besides working on the window treatments, there are a few other things that can be done to improve the look. 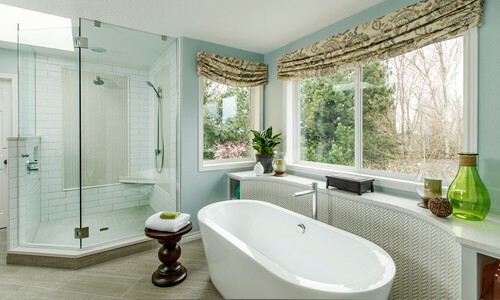 Adding window film is one method that some people may like. 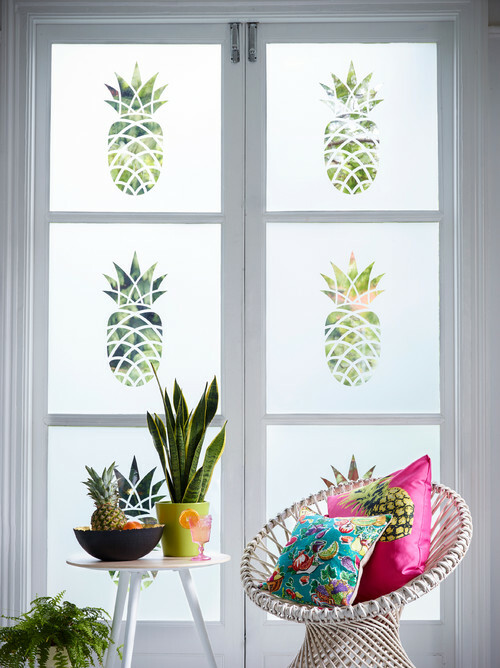 The above window has a frosted film that has been cut to have the pineapple design in the center. And finally, we must not ignore the importance of hardware. Sometimes all it takes to improve the look is to change out the hardware. 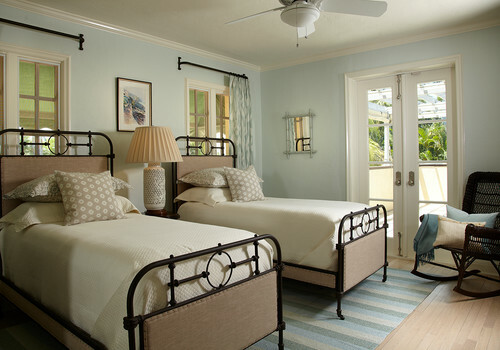 Above, the window hardware closely matches the bed frame. Had they used something plain or different, the look would not have remained true to this style.